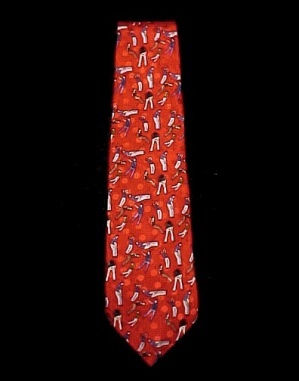 Golf Golfer Golfing Red Necktie Men's Women's Sports. Bright Red 100% Polyester - Satin Sheen with Red Dots and lots of Man and Woman Golfers. They are dressed in Grey - Black - Blue - and Brown. Made in U.S.A. by Henry Alan Neckwear. Measures 4 inches at widest. Great Gift for your favorite Golf Lover!